One or More, Big or Small, Should do it? 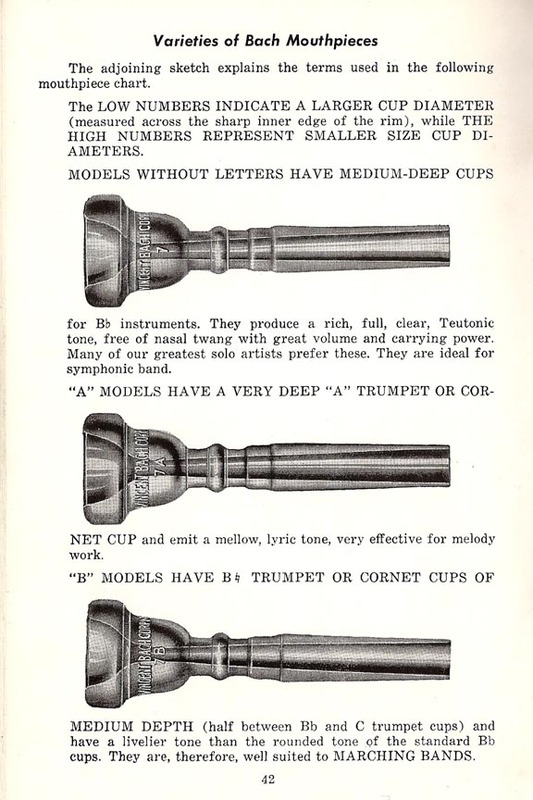 trumpet mouthpieces for performance and their use in pedagogy. In April 2016 I travelled to Belgium to meet with Bahb Civiletti. Bahb is one of the world’s pre-eminent baroque trumpet players and his The Art Of The High Baroque album features some of the only recordings ever made of certain solo repertoire on a natural trumpet (the fruits of him having studied with Jerome Callet and Friedemann Immer can also be heard on his YouTube Channel). Over the time that I spent with Bahb one topic of conversation that came up a few times was that of trumpet mouthpieces. I was quite keen to hear Bahb’s opinion on this topic partly because it is often a point of contention between trumpet players, but also because Jerome Callet asserts quite a strong ideology in terms of mouthpiece choice and I was curious whether this had rubbed off on Bahb at all. When asked he joked about people’s obsessions with trumpet mouthpieces and told a story about how he once challenged a room of people to find a mouthpiece that he couldn’t perform the first sixteen bars of the third movement of Bach’s Brandenburg Concerto on; apparently they couldn’t (including a french horn mouthpiece). On a more serious note he stated that one could learn to play anything they want to with any mouthpiece and that the only reason you may have to change is to get an appropriate tone colour for the music you’re performing. He also recommended to avoid discussing mouthpieces with other trumpet players as these things always end in an argument. Since the popularity of my article about Vincent Bach mouthpieces I’ve been trying to write a more general follow-up and, like many of my articles, I have a number of failed attempts in my drafts folder. The other day I met with some trumpet-playing friends and the inevitable debate began. By the time the discussion had finished there was no clear movement in anybody’s opinion. Plenty of good points were made but these decisions tend to be intrinsically tied to deeply held opinions based upon very different levels of experience, exposure to ideas, and goals when playing the instrument. What you will read here is my attempt to describe a few conflicting attitudes that people have towards choice of mouthpiece that I hope will be helpful not only to make informed decisions, but also in understanding why no choice you make will ever please everyone you meet. A particularly prominent voice in the trumpet pedagogy world is Claude Gordon. Claude’s philosophy is that once you have addressed all aspects of playing technique in a systematic, progressive way then you will be a competent player and that all abilities are inevitable. He says in his book Brass Playing Is No Harder Than Deep Breathing that an aspiring trumpet player should buy one good mouthpiece and stick with it. This is a conclusion that he came to after spending much of his playing career searching for the “perfect mouthpiece” and his intention behind the advise is to warn others not to make the same mistake, which would be to believe that a change of equipment is of equal value to quality practise. His recommendation for a sensible mouthpiece is one with and open backbore, longer v-shaped cup and a wide throat. Claude talks against using mouthpieces that feel tight, or provide resistance. Claude Gordon’s general rule is that the physical side of playing should be focused mostly on wind power, which goes a long way to explain his ideas about mouthpieces. In musical terms, students of the Gordon school believe that all variations in tone that you may want can come from your intentions as you play. This is a very common idea that Arturo Sandoval does a good job of demonstrating it in this video. Jerome Callet is another famous American trumpet pedagogue. In his teaching he puts a lot of emphasis on the idea of correct sound. To him there is only one correct sound that one should strive to make on the trumpet, regardless of the genre of music you play. He teaches that in attempting to create “a big orchestral sound” many players force their tone to “spread”, which in turn leads to over blowing. His philosophy puts a premium on efficient use of air, stressing that Harry James (often used as a model for tone) only used as much air as was necessary to get the job done. On the subject of mouthpieces Jerry also believes that players can and should only use one mouthpiece. Contrary to Claude Gordon’s teaching, disciples of Jerry favour mouthpieces with shallow cups, long tight backbores and small throats. Callet also alludes to the need for a mouthpiece design to be “balanced”, but I’ve never found an explanation of what he means by that. Whilst consistency is important in your practice and goals as an instrumentalist many believe that choosing one mouthpiece to use forever is likely to cause a player problems if they play a wide variety of music. If you were to only use a shallow mouthpiece such as Schilke 14A4a then you may struggle with soft entrances in an orchestral setting or even making a characteristic sound. Similarly if you always play on a wide bowl such as a Vincent Bach 1X then you are going to need a lot of physical effort to play lead trumpet in a big band. Many players take pride in the so-called strength they’ve built up over years of playing on inappropriate equipment and believe that others are cheating if they aren’t punishing themselves in the same way. K.O. from Stomvi discusses his point of view nicely in this video. Of course some may surmise that the best option would be a middle-of-the-road mouthpiece, thus getting no assistance from your mouthpiece for either job… paraphrasing Mark Van Cleave I’ll just say that average [mouthpieces/ideas/methods] produce average results and average trumpet players. Trying to use logic simply to avoid exploration will only result in missing out on the fruits of knowledge. Roger Ingram studied with Bobby Shew when he was younger and has a very similar attitude towards choice of mouthpieces. On his website he sells a set of six mouthpieces, all of which are intended for specific jobs. The really interesting thing is that he says that he doesn’t even bother to try playing high parts on any but the smallest of these (despite the fact that I’m sure he could nail a killer Double High C on a bucket!!). In his book Clinical Notes On Trumpet Playing Roger recommends that when playing lead trumpet you should use the “smallest mouthpiece you can get away with” and for orchestral playing you should use the “largest mouthpiece you can get away with”. His chapter on mouthpiece selection is actually very interesting and he firmly believes that what works for one person will not work for another. He also talks about consciously placing more or less lip in the bowl of the mouthpiece before you play in order to adapt to the size. A very common teaching practice that I’ve written about in the past is the idea that as pupils progress they should be moved on to bigger and bigger mouthpieces. I wrote about why this isn’t logical in reference to Vincent Bach mouthpieces because of the inconsistencies in design and manufacturing, but if a player were to use mouthpieces of a different brand then that argument would be negated. Another reason that it doesn’t make sense, however, is the idea of strength. Imagine that you start out playing on a Yamaha 11B4. As you become a stronger player you move on to using a Schilke 14, but you’re not strong enough for that mouthpiece so you have to work to build up more strength. Once you master your Schilke 14 you “graduate” up to a “professional mouthpiece”. That could be a Yamaha 16C4, Schilke 17D4d or 18, Vincent Bach 1C, Monette B2, the choices are endless. Unfortunately you’re not strong enough for these mouthpieces yet so you have to work to build things up again. This process is so ridiculous that I am beside myself just writing this explanation. Every time you begin to make progress you’re slapped back to the beginning by the wisdom of “this is how the big boys do it”. It’s not only the constant punishment for practising that annoys me though. The definition of strength in this situation is the ability of the lips to resist an ever-increasing volume of air that if you weren’t using in the first place you’d never need the strength to resist. It was the opinion of Renold Schilke that anybody, whether they’ve every played before or not has strength to resist as much air pressure as required to play any note on the trumpet (refer to this article for more information). Large mouthpieces are really good at hiding poor technique, whether that be allowing the lips to collapse into the cup (usually), poor articulation (yep), or just relying on air to compensate for lack of embouchure (definitely). Large mouthpieces do not teach you to play properly and more importantly they allow you to play incorrectly. Some people will make them work through realising that just because you can use power it doesn’t mean that you should, and everyone else just suffers and starts to believe that not everyone is cut out for playing the trumpet. It is this sort of trouble that makes people lean in the direction of Claude Gordon’s school of thought – get a sensible mouthpiece and work on your technique. When presented only with these two options, Gordon is absolutely the better choice. There are, however, other options. A relatively recent movement in the trumpet pedagogy sphere is Lynn Nicholson. In the last couple of years he has released a number of video tutorials and mouthpiece design that constitute what he refers to as the Mindless Hardware Methodology. The idea behind the MHM is that using a small, v-cup mouthpiece with a very high alpha angle for short periods will force you to learn correct playing habits because playing incorrectly simply won’t work on that equipment. No thinking or analysis is necessary. Whilst this is an extreme example, this idea is not one that I’m opposed to. Players who frequently use small shallow mouthpieces will often point out that they are still capable of using deep mouthpieces whereas the reverse is very rarely true. Users of bigger mouthpieces complain of their lips hitting the cup on shallow mouthpieces and not being able to make a big tone. These are both things that are the results of technique and not the equipment. Often players of larger mouthpieces allow their lips to collapse into the mouthpiece, effectively making it shallower as the distance from their lips to the base of the cup is reduced. Lips in this position are not effective at resisting the air stream and the only solution is to use more air, which makes the problem worse. It is much more difficult to create the compression required for playing high, or making a big tone, when using large volumes of air. Jerry Callet always recommends that people learn to play with shallower cups because you know straight away if you’re over blowing or using too much pressure. How? because the sound stops coming out of the trumpet! Although Jerry would say that once you are making a correct sound you can play anything; Bahb Civiletti points out that as you’re capable of playing bigger gear then you can choose to do that to appease the tastes of others. At the end of the day the conductor is in charge. Food For Thought: Change Your Trumpet Or Change Your Mouthpiece? Recently I went to watch a concert that was given by an ensemble called Spiritato! They are a group of musicians who perform music from the 17th century on authentic period instruments. There were four hole-less natural trumpets in the ensemble, all pitched in D. Two of these instruments were playing high clarino parts and the other two lower tromba parts. Interestingly each member of the ensemble used a different sized mouthpiece. The players of the lower parts had mouthpieces of the size that you’d expect to see in a trombone and the players of the higher parts had mouthpieces that were much smaller. This approach seems to echo the “Right tool for the job” philosophy, and is historically accurate. Also worth noting is that their sounds all blended together nicely as each player made a tone that was appropriate to the pitch they played at. Since the advent of the valved trumpet, in the classical trumpet field, it is pretty standard practice to switch to smaller higher-pitched trumpets when the music ventures above the stave. 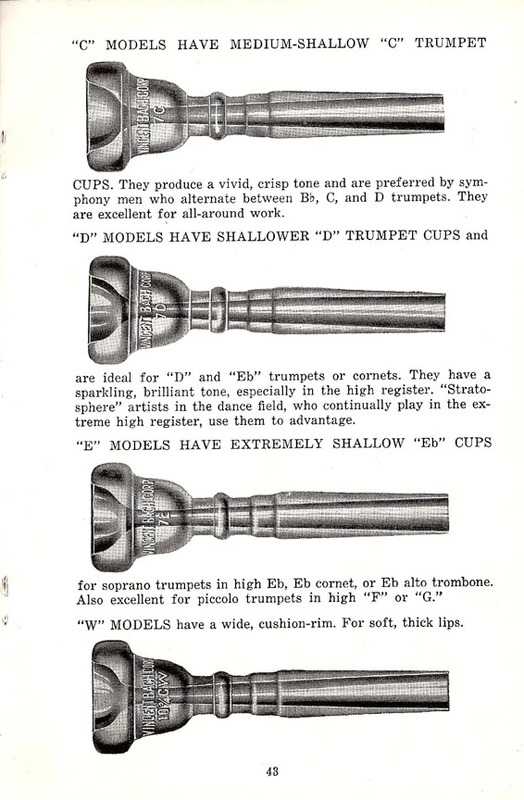 People often tend to use a smaller mouthpiece to match their smaller trumpet and this practice was also recommended by Vincent Bach in his older catalogues (as can be seen here: 1 2). It is a generally accepted rule that the B-flat trumpet, being the largest commonly used, produces the most pleasing tone and also has the best intonation of any valved trumpet. Why do players not simply move to their smaller mouthpiece and maintain a richer sound, rather than changing the whole trumpet? Players don’t realise that the true advantage they get from using the smaller trumpet is that they have a more brilliant, focused sound and sharper attacks. These are the properties that they are often trying to avoid on the B-flat trumpet in the name of having a “dark, orchestral sound”. Allowing your sound to be brilliant, focused and articulate comes with the added bonuses of greater control and range (this simple argument completely changed my trumpet playing for the better!). The final thing that I’d like to mention before leaving you to get on with your day is a myth and lie that is often sold to aspiring players by shops and mouthpiece manufactures. This is an idea that is often sold (literally) to people to keep them trying new equipment when practise and lessons would suffice. I have chosen to represent The Biggest Lie in the form of a graphic. Don’t believe what it says! After all of this, do I regret forgetting Bahb’s advice and starting a conversation with my friends about choices of mouthpiece? No. In a recent podcast Hunter Maats was talking with Bryan Callen about why he gets into arguments with people about their beliefs. He points out that it is the only way to practise clearly articulating your opinions under pressure. The disagreement is relevant because not only may you learn something you didn’t know from someone else’s point of view, but you find out quickly if your arguments hold water. I may have suffered a bit (a lot) of cognitive dissonance upon hearing the improvement in my friend’s playing since taking lessons from Jeff Purtle, but it showed me what has been missing from my practice lately and helped me to finally write this mouthpiece article, which has been brewing for years. Thanks guys! Clearly a well researched and interesting article; well written as always. I was interested to read of the benefits of a smaller mouthpiece as a training aid. This would be something I would be interested to try at some point (with your guidance of course). Interesting subject, although the irony here is that I can remember ‘swapping’ mouthpieces with the writer of this article (between rehearsals) at Bristol Cathedral 3 or 4 years ago. Anyway, I’m not about to disagree with anything that has already been said, other than to add to the ‘triple constraint’ diagram. My ‘constraint’ has always been transposition, which essentially comes in 3 forms, A, C and F, and whether I can transpose the part at sight fast enough. Not being a professional trumpet player, I like to keep things simple, so I either transpose up a tone or pull out the slides, particularly if it’s Rachmaninov’s 2nd Symphony. As an amateur orchestral player, my essential tools are Bb, C and Eb trumpets, which takes care of A, C and F trumpets parts relatively easily, unless it’s a Mahler Symphony, where one may get music written for more than one trumpet, dilemma (!). With respect to the choice of mouthpiece, the player of the day had different bits of tubing to add or subtract to the instrument, so they may not have considered changing the mouthpiece as the lead pipe and bore of the instrument largely remained constant. The modern Bb trumpet has a similar option to adapt the instrument to play in ‘A’ and most intermediate models come with slides to adapt the instrument to ‘C’ so it’s likely that one would choose to stick with the same mouthpiece. However, where the bore of the instrument changes, it makes sense to consider choosing an alternative mouthpiece. For example, I like a mouthpiece with a ‘tighter throat’ where the instrument has a ‘larger bore, and I particularly like deeper mouthpieces for producing darker sounds. Anyway, regarding the design choice of of modern mouthpiece, my biggest curiosity is whether ‘extra mass’ actually makes that much difference with respect to resonance and feedback? I think it may have been a little longer than 4 years, but still – nice of you to remember! Was that when we played The Pines Of Rome, or The Armed Man? I think your point, that people may choose the instrument to ease transposition as much as the ease of playing or change of tonal quality, is quite valid. You’re also right that many people who only play in orchestral settings do tend to favour a larger throat for a C trumpet over their B-flat. In that case they’re countering the effect of the shorter trumpet with the reduced back-pressure from the mouthpiece and it’d probably also go some way to making the C trumpet sound more like their B-flat. That situation would either make Callet’s argument null and void, or maybe even more important! Personally I don’t like larger throat sizes, but I think it may be worth me writing a post at some point about throat size in mouthpiece design. It’s a surprisingly interesting topic and at least as relevant as cup depth or internal diameter. Overall this is a very subjective matter, and one that will massively vary based upon one’s level of experience. A professional player is going to be sensitive to their equipment in ways that an amateur may not be. Similarly a college student who can play for six to eight hours a day will certainly see things differently once they have to work for a living! Essentially I think that I’m aiming a lot of my posts at people who feel limitations in their playing but haven’t been exposed to modern thinking (this absolutely includes music college students – the majority of teachers out there are teaching very old-fashioned ideas and in the age of the internet that’s not really acceptable in my opinion). 1 – Theoretical: The reason for adding mass is to prevent loss of energy. If the vibrations are felt in the equipment then that is energy that is lost from the sound. Seeing as loss of energy is cumulative, having that extra mass near the mouthpiece will help to get that energy into the trumpet. So… a weightier mouthpiece should be more efficient that it’s lighter counterpart. 2 – My experience: Generally I find that a heavier mouthpiece does not respond as well as a normal one. I think that if I were to do a blind test then initially I wouldn’t be able to tell the difference by feel, but over time I’d start to suffer, especially on the low notes. So much of what we experience from equipment choices is the feedback that we feel from it with our lips as we play. The way that we react to that feedback can have quite dramatic effect on the results we get. One of my previous attempts at this post included a long section about how a lot of players are not willing to adapt their playing to different mouthpieces and are simply looking for something that suits or covers the flaws in their playing. When the player has adapted to the mouthpiece then the flaws resurface, and often with others added in! In the end I cut it out because I’d rather discuss ideas that people and it didn’t seem all that positive. Here is an interesting observation, if a C trumpet is essentially just a shorterned Bb trumpet, surely the resistance would be lower on the C trumpet? Something I’ve never understood was that according to physics, the resistance of a tube will be directly proportional to length and inversely proportional to diameter. Am I wrong? This would mean a Large bore C trumpet with a short and large diameter leadpipe should offer much less resistance than a ML Bb trumpet? The whole B-flat verses C trumpet is quite an interest of mine – I wrote my college dissertation about it. I’m not actually sure if I’d agree with everything I concluded at the time but it was an interesting study. I think the answer to your question lies in the fact that note production and perceived resistance has much less to do with air flow than many believe. Instead it is the way that the pressure wave reflects back at your lips. By your suggested logic a trumpet in C with the first valve held down would feel the same to play as a B-flat trumpet (no valves depressed) with the same bore size. This isn’t the case though. It is because the shape of the air column is different in two ways. 1) The sections of tubing that are conical or cylindrical would be in different proportions and at different points along the length of the tube. 2) The number of corners the air column has to turn would be different. Though most would probably argue that this would make less difference than we could perceive from behind the trumpet. Anyway, the shape of the air column is what affects the feel and intonation of a length of tube moreso than just its length or advertised “size”. It’s quite common for players to use a mouthpiece with a more open throat on a C trumpet compared to their B-flat so that they both feel and sound more similar. To me this defeats the point of having the two instruments but I suppose it can depend on other factors such as easier transposition and blending with other players.